In his latest ‘Matters of Testing’ blog for the DVSA, Neil Barlow explains what the MOT Service Team has been working on recently. First of all, I’d like to thank all MOT testers and garages for taking on some big challenges last year. 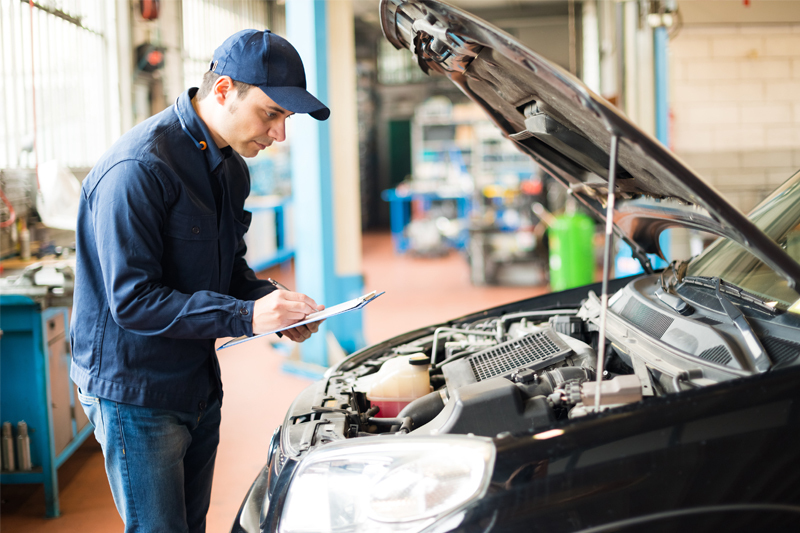 The changes to the MOT test in May and the updated MOT testing manual were the biggest. We’ve got a lot planned for this year, so here’s an extra- long edition of ‘MOT services we’re working on’, telling you what we’ll be getting up to. As you’ll be aware, we recently changed how risk rating works. We made some substantial changes, including more focus on the work that testers do. There’s been a lot of good feedback and that’s really welcome. Changes like this take time to bed in and we’ll continue to develop risk ratings as time goes on. Although the majority of garages are very professional, looking at the risk ratings has helped us target those that aren’t doing things properly. If, as a tester, you’re concerned you’re in the amber or red band, take a look at what might be putting you in this category. This can include things like time taken to carry out tests and the types of vehicles you’re testing. Ratings can and do change. We recognise that this is a particular concern for temporary testers who need to provide information to employers. It would be a good thing if you could show potential employers what you’ve been doing to reduce risks, like appropriate training. I’m sure you’ll all agree that making it easier for us to spot garages that aren’t doing things properly is a good thing. We’ll continue to monitor the risk rating model and will adapt it following your comments on the blog. One of the things we now look at as part of site reviews is a garage’s approach to staff training. This is one of the things that forms part of the overall risk score for a garage – especially their approach to organising testers’ annual training and assessment. Experience from previous years has shown it’s sensible to do your training and assessment in plenty of time. This will leave you time to get any extra training done and to practice what you’ve learned. You’ll then also have enough time to make sure you record the details of your training and assessment correctly. At your next site review, you’ll be able to show that you have an organised approach to carrying this out. Progress so far on completing the MOT training and annual assessment is still low. Don’t leave it to the last minute! In previous blog posts we’ve mentioned that we’re looking to try and reduce the number of vehicles registered incorrectly during MOT. This means the result will be registered against the wrong vehicle, which is a problem. While it might seem like a small thing, it defeats the object of all the hard work we do when results are entered for the wrong vehicle! It also means we spend a lot of time sorting it out, rather than doing useful things to improve the service. In the next few months, we’ll be making some changes to the vehicle registration screens so the vehicle make, model and colour will be even clearer to help testers get the right match. We’re also getting nearer to allowing plug-in to the vehicle diagnostic port. This will mean we’ll be able to get the vehicle VIN directly. In the meantime, it would be great if you could all be extra vigilant when registering vehicles for test. Our research has also shown you need to take the vehicle registration mark and vehicle identification number from the vehicle. You should not get them from a job card or online look-up service. This will make sure the MOT result is recorded against the right vehicle. Everyone makes mistakes but recording the information in this way will avoid the vast majority of these problems. The introduction of the MIL (malfunction indicator lamp) to the MOT test has caused confusion for some MOT testers. In several recent blog posts, we’ve been asked if it’s reasonable to fail a vehicle for the MIL even though the tailpipe emission test was okay. The answer is yes, it’s perfectly reasonable to fail a vehicle for having a lit MIL even if it passes the tailpipe emissions test. Here’s why. Emissions are controlled/measured by various sensors in the engine management system. If the system detects a fault or abnormal reading, then the engine MIL will illuminate. While the vehicle may pass the tailpipe test with the MIL on, emissions are not likely to be within limits during real world driving. 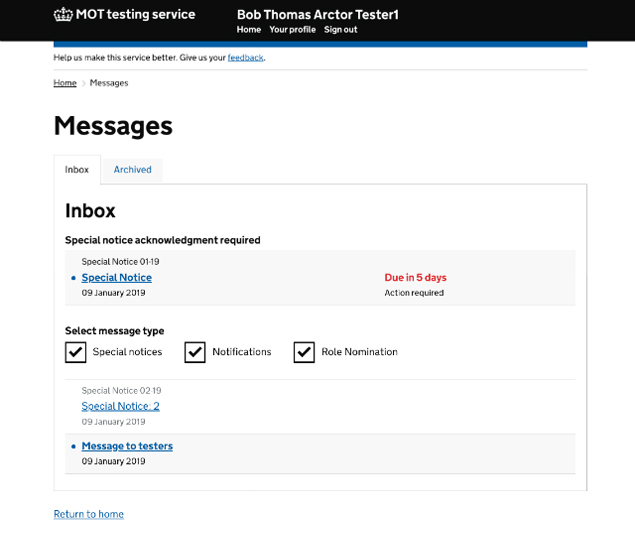 We’ll soon be launching a new, improved messaging page into the MOT testing service. This will make it easier for testers to navigate and find the messages they need to read. We’ll also be introducing a notifications system to tell testers about service outages and remind them about the annual assessment deadline. We’ve been working with developers over the past few months to design and develop these features using feedback gathered from MOT testers at garage visits. In the meantime, Fig 1 shows a preview of how the new message screen is likely to look. We’ll be in contact with testers soon to let them know when they should expect to see these new features.